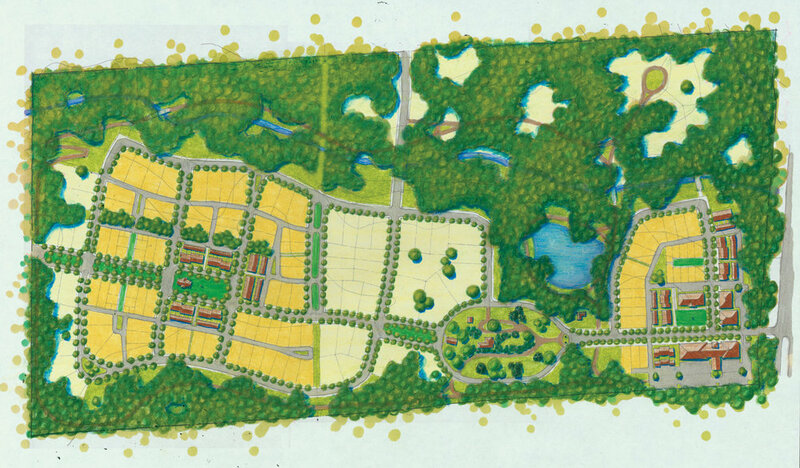 This project is the design for the remaining acreage of a once large plantation just outside historic Eufaula. The owner sought to develop a master plan that would maximize the development potential of the property while preserving the National Register family home and its immediate grounds. The master plan features an entry street lined with mature oak trees that splits around the historic home leaving a generous buffer from future adjacent development. Lots, streets, and open spaces are derived from similar spaces in Eufaula’s Lore historic district. The neighborhood features a wide range of building types from flats above neighborhood retail to country houses on three to five acre tracts. An existing stream on the north side of the property has been preserved and a trail network winds through the 36 acres of natural open space.